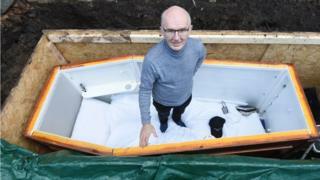 For many people, the thought of being buried alive is the stuff of nightmares but one Irishman is going three feet under for three days - and nights. But he's not alone down there - the coffin has been specially adapted so he can broadcast live on social media. After experiencing what he described as an "incredible encounter with God 27 years ago", he set up a number of Christian rehabilitation centre and homeless shelters. For the next three days, his message of "hope" is coming from beyond the grave in the grounds of Willowfield church in east Belfast. "My plan is to speak to them from the grave before they get there and show them hope," he told the Belfast Telegraph. "When the lid is closed and you're underground, and you hear the soil getting thrown on top of the coffin... it is freaky," he admitted. He also underwent a liver transplant after developing Hepatitis C from a dirty needle, and has survived cancer twice. He admitted his habit of being buried alive is a "bit of a gimmick" but said it was one with a serious message. "I'm desperate to reach as many people as possible."